Do you know that EPF Withdrawal is simplified, now you can withdraw your EPF without employer signature? 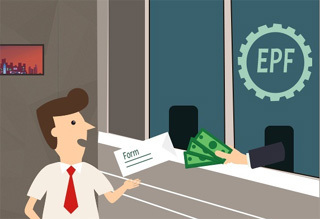 If your employer is not ready to sign your EPF withdrawal form, don’t worry. Now you can straight away approach EPF Office and withdraw your EPF. Remember your employer can not control your EPF money. Have you left your job and employer is not ready to sign EPF withdrawal? As you have not severed notice period and company is not giving clearance about EPF. You left your job. Your relations with your employer is spoiled and they are not willing to sign EPF withdrawal. Whatever is your case, now it is easy to withdraw your EPF without employer signature. Thanks to EPFO for simplifying the lengthy process of withdrawing EPF. EPFO has launched new forms Form-19 (UAN), Form-10-C (UAN), and Form-31 (UAN) for the withdrawal of EPF. These forms are one-page forms require only some minimum information. 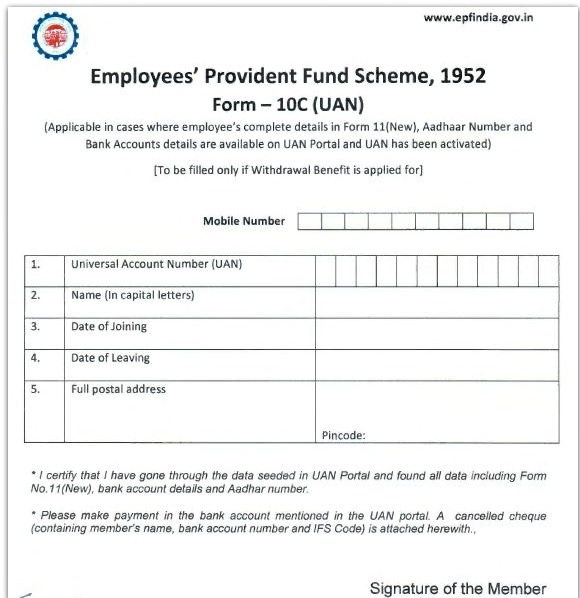 You will be able to use these forms for withdrawal of EPF if you have completed Form 11 (New). Also Read – How to change Mobile Number in EPF UAN Account? You must have UAN Number Activated. Your Aadhaar card and bank details are seeded as KYC on UAN portal. Your Employer has attested your KYC details using Digital Signature. How to do EPF withdrawal without Employer Signature? For full and final settlement of EPF, you need to use New Form 19 (UAN). Kindly verify bank account number and Aadhar card number data in UAN portal. To check verification status log on to EPF portal with your UAN number and password. You will find information about your KYC. You should see verification status “Approved by Employer”. If details are not available you need to complete your KYC. 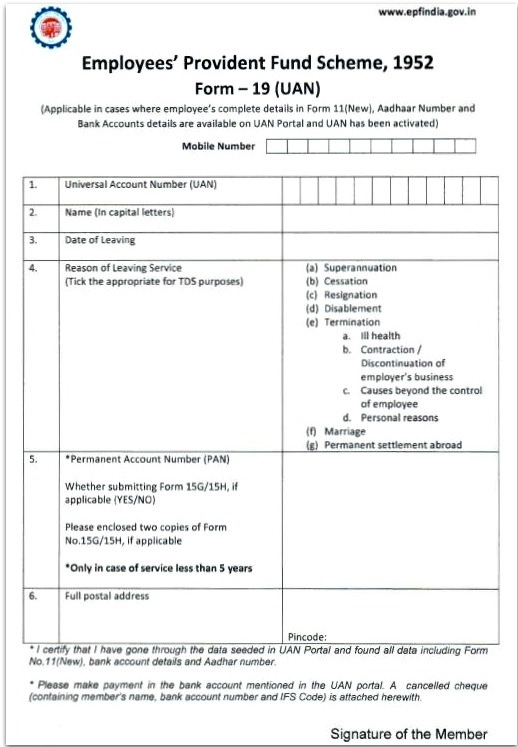 Fill up the New Form 19 (UAN) by providing information like UAN, Date of leaving, Reason of leaving service, PAN card number and full postal address as shown in form below. Submit dully filled form along with cancel cheque copy containing your name, bank account number and IFSC Code to EPFO. For EPS benefit withdrawal you need to use New Form 10 – C (UAN). Fill up New Form 10 – C (UAN) by providing information like UAN, Date of Joining, Date of Leaving and full postal address. 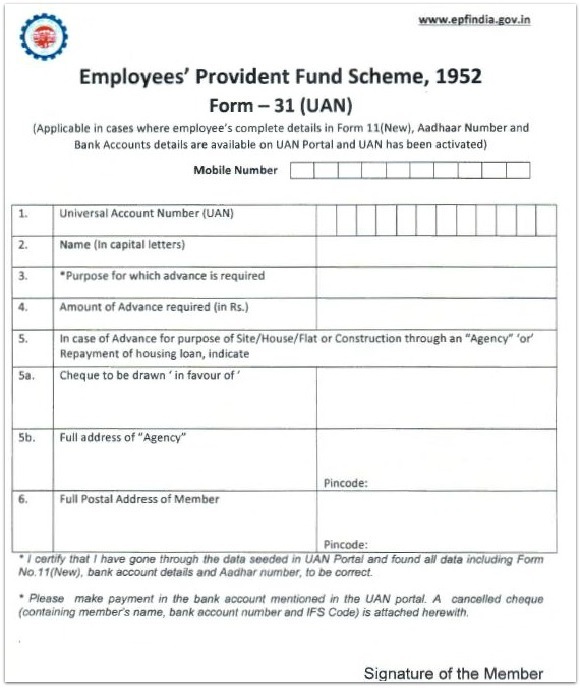 For Partial Withdrawal of EPF you need to use Form -31 (UAN). Fill up New Form 31 – (UAN) by providing information like UAN, Name, Purpose of advance, Advance Amount and full postal detail of member. 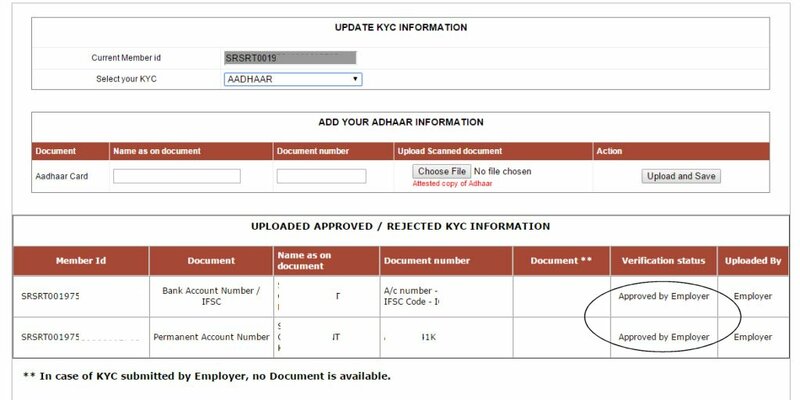 What if your KYC details are not verified by Employer? If Your KYC details are not verified by Employer you can make the claim for withdrawal using regular Form 19, 10C and 31. If your employer is not ready to sign on the withdrawal form you can follow the method given below. Step -1 – Fill up regular from 19, 10C or 31. Step -2 – Get this form attested with the official seal of competent authority like Magistrate, A Gazetted officer, Post/Sub post master, MLA, MP or Manager of Bank where your saving bank account is maintained. This will act as your KYC. Step -3 – Attach a letter explaining about the reason of not getting a signature from the employer. Step -4 – Submit the form, cancel cheque along with letter to regional EPF office. I have applied twice for full & final settlement of my EPF account as my company has closed/ stopped its business in which I was working. I have given affidavit for not working anywhere but still it is not settled. You have got any response from EPF office about EPF claim settlement? You have applied online? Best is to contact EPF office or use grievance redressal. You are requested to contact your Employer.If they are not ready to do KYC kindly fill up regular from 19, 10C or 31. Get this form attested with the official seal of competent authority like Magistrate, A Gazetted officer, Post/Sub post master, MLA, MP or Manager of Bank where your saving bank account is maintained. This will act as your KYC.